St Petersburg is commonly known in Russia as its national sea capital. It is the most popular destination for yachtsmen in European Russia but, over the past few years, the local marinas have faced a tough challenge: the land they occupy appears to be more valuable than their business. “Ten marinas in St Petersburg have been sold off and closed during the past five years,” said Alexander Uralov, spokesman for St Petersburg City Hall. The new owners have built premium cottages and hotels on the land. 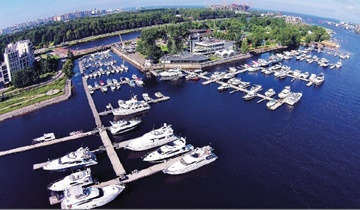 As a result, the total number of berths in St Petersburg shrunk from 3,222 in 2012 to around 2,700 in 2017, according to Uralov, even though some new marinas have opened in the city during this period. Copyright © 2019 Marina World/Loud & Clear Publishing. All rights reserved.